If Washington continues to roll and no one challenges the Huskies for the Pac-12 regular-season title, then the conference may only send one team to the NCAA tournament. 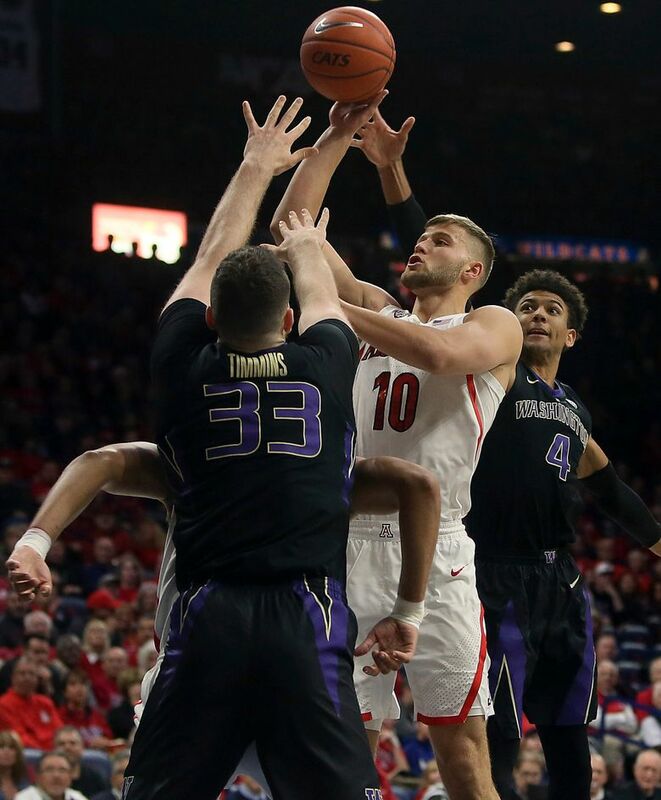 Washington shut down Arizona defensively and ran away from the Wildcats in the second half for a 67-60 win on Thursday night in front of 13,732 at McKale Center. It was another impressive victory for the Huskies – especially considering many of the UW players are sick with flu-like symptoms. Washington (19-4, 10-0) has won 12 games in a row and has a four-game lead in the Pac-12 regular-season title race with eight games remaining. There’s no questioning Dickerson’s toughness after the senior forward returned to the court five days after spraining his right ankle. Anyone who saw him being carried off the court last Saturday night at Alaska Airlines Arena might have had the impression that he would be out at least a week or two. Dickerson had his ankle heavily wrapped and it was apparent during pregame warmups that he was going to try to see how the ankle would respond. Coach Mike Hopkins started Sam Timmins in place of Dickerson and brought him into the game after five minutes. Dickerson played 9½ minutes in the first half and had just three points. He was most effective at drawing fouls (4) and knocking down 3 of 4 free throws. Dickerson started the second half and played 15 minutes. He finished with 10 points and three rebounds, but he made big contributions on the defensive end, including an impressive block early in the second half that doesn’t show up in the statistics. And Dickerson had a few hustle plays, notably a scramble for a loose ball that led to a Matisse Thybulle dunk with 11:10 left. Dickerson also put a lot of pressure offensively on Arizona, which fouled him eight times. Eight Huskies played and five UW players scored in double figures. This team is receiving contributions from nearly every part of the roster. And it’s nearly impossible to say who had a bigger role Thursday. David Crisp scored the most points (17) and made three three-pointers on a night when perimeter scoring was at a premium and Washington converted 7 of 20 shots from downtown. Crisp’s energy is infectious and his daredevil maneuvers are often a high-risk, high-reward proposition. The 6-foot guard tends to struggle scoring inside amidst towering post players, but he’s been remarkably consistent in the past 10 games from long range. In the past four games, Thybulle is averaging six steals. He had seven each against USC and UCLA last week. And Thybulle collected five steals and five blocks at Arizona. The 6-5 guard also had 15 points, three three-pointers, two rebounds and two assists in 26 minutes to offset four turnovers. Jaylen Nowell also had four turnovers, which were his only blemish on an otherwise spectacular performance that included 12 points on 6-for-10 shooting, six rebounds and four assists. Nahziah Carter came off the bench for 10 points, including a pair of highlight dunks. Meanwhile Dominic Green and Timmins, who were pushed into the starting lineup due to injuries and ailments, provided quality minutes. If you’re handing out an MVP trophy, the defense is most deserving. Washington doesn’t relent and proves night after night that it’s going to beat teams into submission with a stifling 2-3 zone that eliminates the opponent’s perimeter attack. It’s really quite amazing. Arizona converted just 4 of 18 three-pointers. One was a misfired shot that banked off the glass. Another was a long desperate heave to beat the shot clock. And the last one came in the final nine seconds when the game was out of reach. Somehow Arizona State managed to self-destruct Thursday night and lost 91-70 at home to Washington State, which had a five-game losing streak and hadn’t won a road game all season. And then Oregon State stumbled into an 83-60 defeat on its court against Stanford. There are two ways to look at those results as a UW fan. In the short term, those were positive outcomes for the Huskies because they moved four games ahead of their nearest competitors for the league regular-season title. But in the bigger picture, ASU and OSU falling back into the four-way tie at 6-4 for second in the conference is bad for the Pac-12 and Washington. The Huskies need quality wins and the Sun Devils and Beavers are now diminished after those losses. ASU dropped to No. 61 and OSU is No. 72 in the NET rankings. Arizona State will likely fall out of NCAA tournament projections while Oregon State’s bid for an at-large berth became more difficult. And the nationwide perception of the Pac-12 took a big hit as well. Looking beyond the regular season, if Washington wins the Pac-12 tournament and captures the league’s automatic NCAA tournament bid then the conference may only send one team to the Big Dance.